Commentary to come. Click to enlarge. 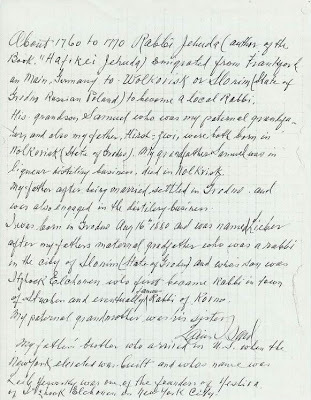 Receipt of Joseph Rabinowitz's death certificate earlier this week provided near conclusive evidence that the simple story of our relation to the illustrious Rabbi Isaac Elchanon Spektor is false. To have been true, we needed Joseph's father to have been named Chaim or Aryeh but it was in fact Abraham. However, Joseph's mother's name opened a new possibility for a close familial connection to the rabbi. She was named Bertha Yesersky. You can see the death certificate here. The thing that is interesting about that is that Isaac Spektor was married to a Sara Yesersky at the age of 13 in 1830, and thereafter lived with the Yesersky family in the town of Volkovisk for a period of six years. You may recall that Spektor was raised by his rabbi father Israel Isser in the town of Ros', just a few miles north of Volkovisk. After his marriage to Sara, he came to study in Volkovisk under the eminent rabbi Benjamin Diskin. He lived on the largesse of his father in law Eliezer Yesersky for those six years until he took on his first rabbinical appointment in another nearby village, Izabellin. Now let's suppose that Eliezer and his wife Bluma have more children than just Sara. Since Joseph Rabinowitz is born in 1855, his mother was probably born somewhere in the range 1820-1835. What if Bertha Yesersky is a daughter of Eliezer and Bluma and is born in 1825? Then should would be five years old at the time of her older sister's marriage, and she would spend the next six years of her life closely influenced by the young man who would become a great rabbi who is sort of her big brother. Louis Isard note about Yesersky genealogy, circa 1958. Interesting but it might be a stretch. To check it out, I start looking up Yesersky on JewishGen and Ancestry, and there is no shortage of good leads. Right away, I see that there are two people listed as Yesersky, or Yezersky, researchers, a Joan Sohn in Toronto and Jay Cohen in Silver Spring, Md. I emailed both of them introducing myself, and both replied within a few hours. Since then in email exchanges with Joan and Jay, as well as with two others, Steven Director and Robert Isard, I have learned a great deal about the Yesersky family both in Volkovisk and nearby cities as well as in Philadephia, where most of them ended up when they came to America. I will try to summarize. Several of the Yesersky family members have a similar theory to mine but with Miriam as Sara's sister. That could well be, but there is a further twist in their case because Miriam was later married to Shmuel, son of Rabbi Joseph Lieber. The odd thing is that Shmuel would take the Yesersky name as his own, which seems peculiar on first thought but is not completely outlandish. Especially in this family, where name changing seems to be the norm. But let me cut to the chase. Shmuel and Miriam have at least three children. We know that one of them Solomon raised his family in the nearby village Swizloch while another Zvi Hirsh moved to the bigger regional city Grodno. 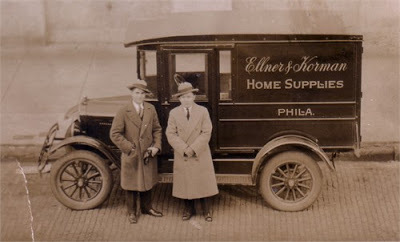 Both brothers had sizable families and many of their descendants would end up in the Philadephia, as I said. One branch of Philadelphia Yeserskys are the Kormans. Sam Korman is at right. One such was Louis Isard, who was born as Louis Yesersky, the son of Hirsh, in Grodno in April 1880. How his name changed—his and many other relatives who also became Isards—is not well explained. But hold that thought. In the late 1950s, Louis is recovering from a heart attack and receives a visit from an Israeli cousin Tsvi Jezerski. Previously Louis didn't like to share a lot of family lore, but Tsvi prevailed on him to set down on paper the fascinating details of his family history. That included a family tree and a remarkable story involving not one but two illustrious rabbis. You can read Louis Isard's note for yourself, but I will run through the high points. Louis says that his grandfather Shmuel Yesersky is the son of Rabbi Joseph Eliezer Lieber, and that Lieber is the son of the very famous Rabbi Judah Low Edel of Slonim, a city only 30 miles from Volkovisk. Two generations older than Spektor, Edel was known as a great Torah scholar and was the author of an influential book of teachings and several Hebrew lexicons. Here is his biography in the Jewish Encyclopedia. Louis writes that Edel's grandson Shmuel becomes the husband of Miriam Yesersky, who he describes as the sister of Isaac Elchanon Spektor. He also writes that one of his uncles, Leib Yesersky, was among the founders of the Isaac Elchanon yeshiva in New York in the late 1890s. The note seems to have a few things mixed up, but mainly it checks out with known facts. We know that both Miriam Yesersky and Sara Yesersky are from Volkovisk (which by the way we don't know about Bertha). If she is a sister, she would be Spektor's sister-in-law, and would have grown up with him in the household. The fact that her son Leib goes to America and is a follower of Spektor there suggests the great influence that Isaac had on the family. So I am inclined to accept Louis' story at pretty much face value, despite all the peculiar name changing. Now the question becomes can we connect our Bertha Yesersky with the Yeserskys of Volkovisk. So far there is no hard evidence but there is one tantalizing tidbit. The note-writing Louis Yesersky Isard had a sister name Bertha Yesersky who born in 1878. If our Bertha born around 1825 was a sister of Sara Yesersky, and Miriam was also a sister, then the older Bertha is the great aunt of the younger one. With the Jewish prohibition on naming for living relatives, the older Bertha must have passed away before 1878. Maybe her passing was the cause for that naming. So I was going to quit on that point, but I just came across an oversight in my work. Almost a year ago, I was contacted by Shirley Portnoy for help on something related to Rabbi Spektor. Unfortunately, I was just then going into the hiatus in my research from which I am now emerging, and I fear that I was not at all helpful to Shirley. Well I just this moment stumbled across her old correspondence, and guess what? She is also related to Yeserskys from Volkovisk and Grodno. Her great great grandmother is Sarah-Taibe Yezerski and she also mentions a Gruna Yezerska. I'm going to go write to her now with apologies for my long absence but perhaps bringing her some useful new information. Bravo to Dan for all of his amazing research since we got the death records for Joseph Rabinowitz and Lena Lincoff Rabinowitz. I also very much would like Bertha Yesersky to be the sister-in-law of Rabbi Spektor, as it would tie things up nicely with a pink ribbon, but as the culprit who led us down the garden path with my Alex Haley moment in the Yeshiva University archives three years ago, just assuming that the Joseph Rabinowitz mentioned in the Shimoff book and Toldos Yitzhak as having been trained in the Tamlud and Jewish Codes by Isaac Elchanan Spektor, MUST by our Joseph, the grandson of the great rabbi, I will now play the role of skeptic who warns about making such conceptual leaps. In short, I've been burned once before and its a powerful lesson. 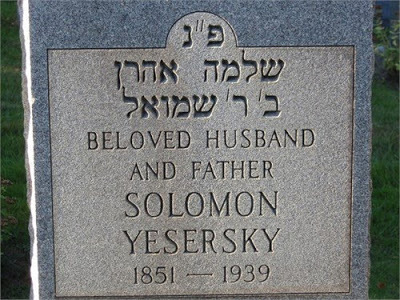 Still, as you say, there is the name Bertha Yesersky popping up as Joseph's mother, and we know Sara Raizel Yesersky was the wife YES married at the age of 13, so there must be a family connection there. I must say that even as it became more and more clear that our Joseph Rabinowitz was NOT after all, the son of Rabbi Chaim Rabbinowitz and the grandson of YES, I never lost my bedrock faith that we were descended from Rabbi Spektor in some manner, because Stan Ruby told me so on a number of occasions during my childhood and he obviously would not simply have made that up. Obviously that information came from his father, Walter Ruby, but the exact nature of the connection got a little muddled over the years. So to see the name 'Bertha Yesersky' on Joseph's death certificate is certainly very powerful and compelling. I went with Gene to the Mt. Zion cemetery on Saturday to check out and photograph the graves of Joseph and Lena Rabinowitz, only to learn to my dismay that Jewish cemeteries in the U.S. are locked up on Shabbat. Then we popped over to Mt. Hebron to see if by chance that onje would be open and Gene could meet Walter Ruby and Selma Ruby, but of course it was locked as well. I had somehow understood that the cemeteries would be open, but the offices closed, but I had figured we could find the graves without their help as we had the row number etc. Most disappointing because I may now not get a chance to go until after returning from the second of two trips around Sept 7. Gene plans to go on his own before that, but he seems to have lost the battery of his camera, so may not be able to take photos. He has gotten interested in the family history thing recently; as he has realized that he lives between two cemeteries in Queens; one holding the remains of his great-great grandparents and the other his great grandparents. He was asking me a lot of questions about who they were etc, and that gives me a great feeling about what we have managed to do over the past five years to preserve and unearth the memory (much of it previously lost) of these forgotten generations for our kids and generations to come. All of this is a profoundly spiritual experience for me as I approach 60. Also for next month, I will make a trip to Varick Street to look for the ship record of the arrival of the families of Joseph Rabinowitz and Lena Lincoff in New York. After Gene and I struck out at the cemeteries, we drove around talking and ended up in Flushing, Queens, so I took him to see one of the forgotten pieces of New York history, a Quaker meeting house on Northern Boulevard built in Cape Cod style that goes back to the 1690's, and a site a few yeards away where the English Quaker settlers of Flushing (a Dutch name) in 1655 demanded religious liberty from Peter Stuyvesant, the leader of nearby New Amsterdam whose sovereingity extended well into Long Island and up the Hudson River to Albany. The plaque at the site makes the point that the origins of the First Amendment to the Constitution (at least the freedom of religion part) flow from that incident in Flushing. Its one of those examples of forgotten history that we pass a million times a day and are blissfully unaware of and I think it impacted Gene a bit. Flushing, long very Jewish, nowadays has become New York's largest Chinatown (and Koreatown and Japantown and a little distance away India, Pakistan and Afghantown and is a wonderful place to step out of prosaic American reality and be swept into an Asian one. After our excursion the two of us went to a Japanese/Korean restaurant and discussed Israel and the Palestinians for several hours. All in all a great day with my son, even if we did miss the great-greats.